The Ankylosaurs form a group of heavily armored ornithischian dinosaurs best known by its North American cretaceous representatives, Ankylosaurus and Euoplocephalus. Ankylosaurs and Stegosaurs together form the Thyreophorans characterized by a body covered with an armor consisting of scutes, spikes and plates, that are highly derived osteoderms (ossified scales commonly found in various groups of vertebrates such as the crocodilians). The Ankylosaurs are divided into two or three families. The Nodosaurids have a narrow skull, a club-less tail and large spikes while the Ankylosaurids have a distinct bony club at the end of their tails and a wider body. In addition, some authors detach some Nodosaurids, into a third family, the more lightly built Polacanthids. Scelidosaurus harrisonii from the Early Jurassic of Dorset, is an early thyreophoran close to the ancestral stock of both stegosaurs and ankylosaurs. There is however a large gap in the fossil record between the first definite ankylosaur in the United Kingdom and Scelidosaurus. Jurassic ankylosaur remains are so fragmentary that not much definite can be said about them. In the Middle Jurassic (Bajocian, 170 MYA), an incomplete radius and ulna (forearm bones) from the Isle of Skye in Scotland, described by Clark in 2001, possibly belongs to an ankylosaur, unless it is a stegosaur. A bit younger (Middle Jurassic, Callovian, 163 MYA), Sarcolestes leedsi is known from an incomplete lower jaw from the Oxford Clay Formation in Cambridgeshire. Three osteoderms recovered from the same formation have been attributed to it (Galton, 1994). It was originally thought to be a theropod (thus its name meaning “flesh robber”), before being classified as a stegosaur, then an ankylosaur of some sort. From the Late Jurassic period (Oxfordian, 160 MYA), a right femur found in the Ampthill Clay Formation of Cambridgeshire was named Cryptosaurus eumerus and first attributed to an ornithopod, until Peter Galton placed it among the ankylosaurs (1983). A maxilla of the same age named Priodontognathus phillipsi was found in Yorkshire. 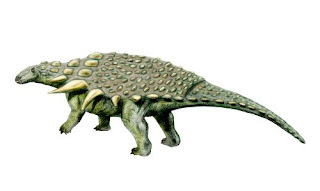 This also was first attributed to an ornithopod before Galton classified it as a nodosaurid ankylosaur (1980). Better ankylosaur material appears in the Early Cretaceous with Hylaeosaurus and Polacanthus. Hylaeosaurus armatus is one of the original three animals (the others being Iguanodon and Megalosaurus) used by Sir Richard Owen to define the then new group he called Dinosauria in 1842. This 6 meter long polacanthid nodosaur is known from the Turnbridge Wells Sand Formation (Grinstead Clay member) of Valanginian age (~138 MYA) and its remains have been discovered in West Sussex. The holotype found in the Tilgate Forest area by Gideon Mantell in 1832 consists of the anterior portion of an articulated skeleton including a small portion of the skull. A second specimen from Bolney was partially destroyed by workers before Mantell could salvage a few bits including a left scapula, a fragment of the right scapula and a left tibia. A third specimen found by Mantell in 1827 from the Tilgate Forest quarry consists of an incomplete caudal series with armor (originally named H. oweni). From Mantell’s Bolney material combined with remains found in the Isle of Wight, Nopsca erected the new genus and species Polacanthoides ponderosus in 1928. Today, the Bolney material is attributed to Hylaeosaurus armatus while the Isle of Wight material is considered to belong to Polacanthus foxii, making Polacanthoides an invalid name. Hylaeosaurus is still a quite obscure animal despite being one of the earliest described dinosaurs. It was probably closely related to Polacanthus. Polacanthus foxii, which was for some times being considered to be the same animal as Hylaeosaurus, is nowadays generally thought to be distinct. Stratigraphically, it is slightly younger, appearing only in the Wessex and Vectis Formations of the Isle of Wight of Upper Barremian age (~ 125 MYA). The generic name appears first in a anonymous field note from 1865 attributing the paternity of the name to Richard Owen. The holotype collected by the reverend William Fox consists of the rear end of the animal. A second specimen described by W. T. Blows in 1979 consists of neck vertebrae and anterior armor. A third specimen is currently in private ownership. A portion of a pelvis and some dermal armor, originally named Polacanthus becklesi by Hennig in 1924 is now considered to belong to P. foxii. Many other various bits attributed to P. foxii have been found including the now lost Isle of Wight parts used to define Polacanthoides ponderosus described above and the single spine named Vectensia by Delair, 1982. Polacanthus foxii was a 4-5 meter long nodosaur, serving as the type to the polacanthid family. Blows has erected a second species of Polacanthus, P. rudgwickensis, in 1996 out of a partial skeleton from the mainland found near Rudgwick, Sussex. This species appears to be slightly larger and more robust than P. foxii but its validity has been disputed. From the mainland Upper Greensand Formation of Albian age (~110 MYA), a number of fragments were attributed to ankylosaurs and named into several genera including Anoplosaurus, Acanthopholis, Eucercosaurus, Syngonosaurus and Macrurosaurus and a plethora of species. All of them, save perhaps Anoplosaurus curtonotus are dubious in the sense that from such fragmentary remains there are no unique characters to define each of the species. Anoplosaurus curtonotus has been described from various fragments from a juvenile individual and probably belong to a nodosaurid of some sort. The second species, A. major is probably chimeric. The genus Acanthopholis was often illustrated in dinosaur books but all the 7-9 species described, including the type A. horrida, were determined to be dubious by a review by Pereda-Superbiola and Barrett (1999). This concludes our tour of the British Isles Ornithischians. Now to the Saurischians. Original artworks on Paleoexhibit are copyrighted to Nobu Tamura. Do not use without permission (Email: nobu dot tamura at yahoo dot com). Blows, W. T. 1982. A preliminary account of a new specimen of Polacanthus foxi (Ankylosauria, Reptilia) from the Wealden of the Isle of Wight. Proceedings of the Isle of Wight Natural History and Archaeological Society 1980 pt. 5(7):303-306. Clark, N.D.L. 2001. A thyreophoran dinosaur from the early Bajocian (Middle Jurassic) of the Isle of Skye, Scotland. Scottish Journal of Geology, 37, 19–26. Fox. W. 1866. On a new Wealden saurian named Polacanthus. Report of the British Association for the Advancement of Science, Birmingham 1865:56. Fox. W.1866. Another new Wealden reptile. Geological Magazine 3:383. Galton, P.M. 1980. Priodontognathus phillipsii (Seeley), an ankylosaurian dinosaur from the Upper Jurassic (or possibly Lower Cretaceous) of England. Neues Jahrbuch für Geologie und Paläontologie Monatshefte 1980(8):477-489. Galton, P.M. 1983. Armored dinosaurs (Ornithischia: Ankylosauria) from the Middle and Upper Jurassic of Europe, Palaeontographica Abteilung A 182(1-3): 1-25. Naish, D.; and Martill, D. M. 2008. Dinosaurs of Great Britain and the role of the Geological Society of London in their discovery: Ornithischia. Journal of the Geological Society, London 165 (3): 613–623. Pereda-Suberbiola, J. 1993. Hylaeosaurus, Polacanthus, and the systematics and stratigraphy of Wealden armoured dinosaurs. Geological Magazine, 130, 767-781. Pereda-Suberbiola, J. 1994. Polacanthus (Ornithischia, Ankylosauria), a transatlantic armoured dinosaur from the Early Cretaceous of Europe and North America. Palaeontographica Abteilung A 232(4-6):133-159. Pereda-Suberbiola, J. & Barrett. P.M., 1999. A systematic review of ankylosaurian dinosaur remains from the Albian-Cenomanian of England, Special Papers in Palaeontology, 60: 177-208.